Many people develop arthritis in their joints as they get older. Contrary to popular belief, your joints do not wear out through overuse. People who do the least exercise can suffer arthritis earlier – activity and exercise actually helps to strengthen bones and joints and to delay the loss of cartilage from the ball and socket joints such as the hip. Once this does start to wear away, it cannot be replaced and when bone starts to rub against bone, the damage to the joint really starts to accelerate. This causes pain and discomfort and makes moving about very difficult. As arthritis can occur in people in their 50s or even earlier, having arthritis in a hip joint can be very disabling and can severely restrict normal life in someone who is young and otherwise fit and healthy. Hip replacement has been an option for people with arthritis since the 1960s, when it was pioneered by John Charnley, a British orthopaedic surgeon. Techniques and materials have developed since then and having a hip replacement is now considered a fairly routine operation. This doesn’t mean that it is completely without risk, but it can be done safely and can provide a new lease of life. During the operation, the original, diseased ball of the femur is removed, along with the damaged socket in the pelvis and is replaced by a prosthetic joint made from polyethylene (the socket) and metal, in the case of a cemented joint. This is fixed in place using bone cement, which sets very rapidly during the operation. 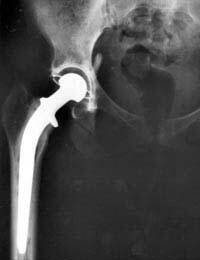 Other types of artificial hip use metal components for both parts of the joint, and these are not cemented in. They are fixed in but their outer surface is rough, so fools the body into regarding this as a broken bone. The natural healing process that takes place in the weeks after the operation seals the joint in place. The hardest part about a hip replacement under the NHS is waiting times, although steps have been taken to try and improve these. It is still not uncommon to have your operation a year after you first see an orthopaedic specialist, however, and many people opt to have their hip replacement done privately if they have health insurance through work. This can cut waiting times down to several weeks, which are needed for assessment and health checks and to book the operating room and surgeon. Most centres, whether NHS or private, recommend that you have a full health check for heart and lung function and also swabs taken from your skin to check if you are carrying methicillin resistant strains of Staph aureus (MRSA). If you are, this could mean that your wound could become infected after the operation, so you may need treatment with antibiotics active against MRSA before you can have surgery. The operation itself lasts for about 2 hours and you will have a full general anaesthetic and be completely unconscious throughout. Afterwards you will be monitored carefully for a couple of hours but you should be back in your room or the ward within 4 hours. After resting for 24 hours and recovering from the anaesthetic, you will then start to do exercises and become mobile as soon as possible as this will enable you to recover faster. What About Pain and a Hip Replacement? For a couple of days after the surgery you will be given painkillers but you will find that the pain after the operation is probably not as bad as the pain you were experiencing beforehand, particularly if your hip was very badly affected by arthritis. Most people find that they are virtually pain free within 2 weeks, and find their quality of life improves very quickly. It is important to follow the advice of your medical team and physiotherapist after your hip replacement to make sure the results are the best possible. You will initially be shown how to walk on crutches that are correct for your height and you should walk and exercise as recommended to strengthen the hip joint. You will progress to two sticks and then one, and then you will be able to walk unaided. At this point some people become psychologically attached to a stick, but it is usually not necessary and your mobility should improve vastly on your pre-op levels within about 3- 4 months. So great are the results that some people who need both hips replaced often ask for the second operation to be moved forward if possible.